We must convey/build this positive expectation to mom if she does not have it. *She can tell us if she has it or not. Importantly it moves from mom to child unseen but expected by our society. It is a blind spot to some. Absorbent Mind by Maria Montessori. in our society now and into the 21st century. USA VALUES, LLC.. wishes to focus on the risk that demonstrated earnings will not occur for 100% of the children turned adults because the risk has not been reduced to normal by the parent and society. In any asset valuation higher risk creates a lower present value of the expected future flow of revenue. Practically, for marketing message purpose we see the present value of the positive expectation from very solid early reading skills achieved by the child at age 6 to be $500,000. We can sell this valuation to mom when we place her situation with her child between bookends with many valuations from a low value (high risk) to a high value (low risk). The daily issues are risks in our calculation and they are literally first things first put behind the child when early reading skills are successfully delivered before kindergarten. In high risk areas this is not easy to do and to assure delivery a mentor of mother and child is required and continuous improvement is expected. When mom insists on this learning before age 6 the risk to not having the early reading skills are low and the expectation value is high. Bookend earnings are provided and we assume that if a child is public sector ready before kindergarten starts he/she is going to graduate high school and at least attend some college or get a 2 year degree. It is our intention to make very reasonable assumptions. Like being really-ready to read at age 6 projects more likely a college graduation and beyond, but we are not using that achievement beyond within the bookends of present value of expected earnings at age 6 because it is not required to make the case. However, just for society to predictably operate we can assume a child really ready to read before kindergarten is likely going to college and will graduate. Earnings based on education is provided by The 4% Solution by the George W. Bush Institute published in 2012 on page 10. The thinking that for a population of plus 4,000,000 children graduating per year that earnings levels would track with education is also reasonable. We do not get exact here and we use bookends to arrive at a value based on the future expectation of earnings at age 6. High end learning at age 6 taking advantage of the sensitive period to learn language, order and math is conservatively assumed (low risk assumption) to follow with expected four year college graduation outcomes. We are forced to assume conservatively that best outcomes going into kindergarten based on actual observation would be really-ready to read Bob Books, counting, capacities, physical relationships and understanding positive expectations would align with college degrees as a best outcome. Preschool defined by public sectors does not include being really-ready to read at age 5-6 as a best outcome. The private sector produces that best age 6 result either within the family unit or higher quality preschools using the likes of Montessori reading and math materials and self correcting activities “by the book”. This knowledge can be observed within the child. Tests are not required. .
We don’t have to deal with the issue of the children being really ready to read before kindergarten but falling out before 3rd grade tests because if the 100% were achieved or even 50% were achieved the K-3 would be restructured into individual efforts. There would be no choice but to reform grades K-3. Lost soul is estimated to earn ½ of the wages of a drop out or $600,000 (This is the base future GDP value of being subject to repeated risks and lack of opportunity and not being really ready to read) Assuming a 10% risk factor used as the discount rate the present value is $35,000 at age 6. A dropout is defined to earn $1,200,000 in 51 years; Age 16-67; at $26,000 per year. Assuming a 10% risk factor as the discount rate the present value is $61,000 at age 6. A high school graduate without really ready to read skills starting kindergarten is defined to earn $2,184,000 in 47 years; Age 20-67; at about $45,000 per year. We assume a 10% risk factor until graduation of high school and then convert it to a 6% risk factor for the rest of life to arrive at a present value of $290,000 at age 6. A high school graduate who has really ready to read skills starting kindergarten is defined to earn the same $2,184,000 in 47 years; Age 20-67; at about $45,000 per year. We assume a 6% risk factor until graduation of high school and then convert it to a 2% risk factor for the rest of life to arrive at a present value of $1,040,000 at age 6. Some college or an associate degree who has really ready to read skills starting kindergarten is defined to earn $2,565,000 in 45 years; Age 22-67; at about $60,000 per year. We assume a 2% risk factor to that outcome to arrive at a present value of $1,300,000 at age 6. The 4 year degree who has really ready to read skills starting kindergarten is defined to earn $3,660,000 in 43 years; Age 24-67; at about $90,000 per year. We assume a 1.5% risk factor to that outcome to arrive at a present value of $2,600,000 at age 6. The point is in the process of preventing the lost soul (society’s most expensive citizen), society should also prevent the dropout and creates a high school graduate who will go on to some post secondary education because they have the capacity to create normal opportunity and the risk is low because Literacy is Freedom. Nobody can value another as an individual per the above but the bookends will end up putting a value on each and every child and a conservative value for the effort can be used in planning and funding the effort and most importantly discussing the concept of present value with urban mom. See ERSD-RA as that risk reduction effort. The ERSD-RA talked about on this site correlates to a 4 year degree, especially when mom is involved as an influencer. I hope everyone can see a fully resourced effort to create the 4 year degree is the only way to address the urban locations to remove the gap and convince urban mom to be influential in her child’s education before kindergarten and after. It is common sense that any effort started at age 0-6 has to have an end in mind of the 4 year degree (to close the gap) as a best outcome. To reduce the risk of that 4 year degree not yielding at least the $3,660,000 lifetime earnings the child should be really-ready to read, count and understand positive expectations as an achieved best practice and outcome at age 6. These are conservative assumptions to set the workings in place for a high quality effort with continuous improvement measured. We use $500,000 as the PVofPE-Prek to be conservative in our marketing to urban mom. Our estimates show it is likely that the present value is under $300,000 at age 6 without being really ready to read before kindergarten whether the child graduates high school or not. Risk is high until high school graduation, but even then the risk of earnings remains high for all of life. 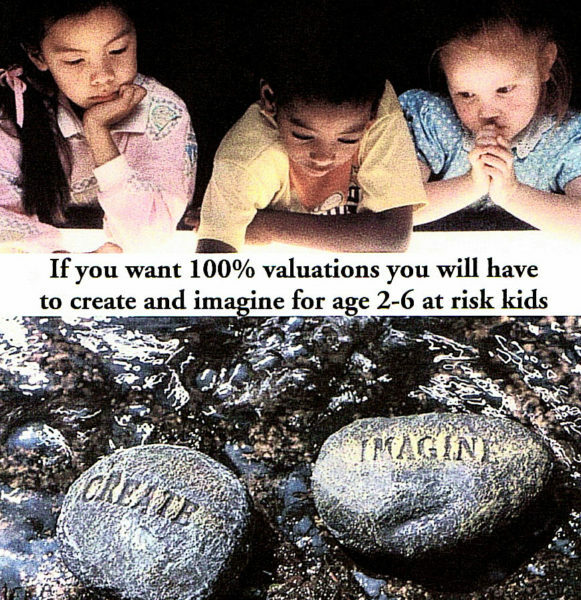 The present value jumps to $1,000,000 or more when the child is really-ready to read before kindergarten, the created cause of reduced risk is assumed to tag along with being really ready to read at age 6. We are stating that outcome achieved puts the high risk on the sideline for the child. So in a very conservative statement we would suggest not being really ready to read has a PVofPE-Prek of less than $300,000 and higher risks; being really ready to read has a present value of $500,000-700,000 and reduced risks. Remember if the above is true the K-12 school district is adding value to the child every year and logic screams that the most value being added (and the lowest risk) to a child is when they start out having achieved best outcomes from best practice at age 6 with a target of a 4 year degree. You would never start out with the end in mind of less than a 4 year degree if your efforts were represented to urban mom as best practice in search of best outcomes to eliminate the gap.. That means at age 0-6 you cannot start out the gap eliminating education without the goal of being really-ready to read before kindergarten. Problem is you can really only find that in the private sector or within the family unit. Urban mom needs a better deal than what the public sector is presenting. USA VALUES, LLC. has used at least $500,000 in its discussions, since 2008. See the attached PVofPE-Prek worksheet in PDF format. Use the size tools as needed. The goal of this worksheet is to reflect bookend valuations for decisions and considerations. Relevant real outcomes are going to fall inside the values on this sheet. Click here. The above evaluation, all age 6 children will be valued by kindergarten teachers of school districts contracted by the private sector part of the Federal Reserve Banks Monetary Policy of ERSD-RA. Certificates will be issued after such evaluation to parents and guardians for display by the child as a Certificate of Early Achievement and it will reflect a valuation. Such valuations will be aggregated in total without reference to the child to accumulate a running balance offset to the US Treasury deficit as a proforma note to the private sectors initial first things first gift to we the people starting kindergarten and the path to growth education, economics, emotions and ethics. Just for the record, a maximum valuation ($700,000 per age 6 child) based on 4,000,000 children starting kindergarten is $2.8T per year. This is to add perspective to the US Treasury annual budget and balance sheet deficits. We are forced to assume conservatively that best outcomes going into kindergarten based on actual observation would be really-ready to read Bob Books, counting, capacities, physical relationships and understanding positive expectations. These bests would align with college degrees as an expected best outcome. Preschool defined by public sectors do not include being really-ready to read at age 5-6 as a best outcome. The private sector produces that best result either within the family unit or higher quality preschools using the likes of Montessori reading and math materials and self correcting activities “by the book”. Parents using the knowledge can observed the child. Parents and mentors using the likes of Montessori reading and math materials and self correcting activities have existed in the private sector for the last 100 years. This is a serious shortcoming that USA VALUES, LLC. addresses in the private sector with a mentoring service of child and mother to be ready delivered outside of the Preschool, Universal Pre-K, Head Start, or school readiness capacities that exist. These capacities generally do not use actual outcomes in the definition of quality and they do not have a traditional definition of quality that includes measurement of actual outcomes and continuous improvement. What is the nation to do? The public sector can not close the gap with the new capacities created in the last 15 years because they just do not go there with understandable quality definitions. It gets worse because there is no money or rainmaking for “good quality” that does not close the gaps. That cat is out of the bag and known by those knowledgeable in the private sector. We did not make this up, it is the result of trying to apply what experts have put forth as the solution to the GAP. That is mostly defined by this work. Reroute the Preschool Juggernaut, http://www.hoover.org/publications/books/8138 by Chester E. Finn Jr. AND, The Absorbent Mind by Maria Montessori https://www.amazon.com/Absorbent-Mind-Maria-Montessori/dp/0805041567 AND, Montessori Read and Write, A parent’s guide to literacy for children by Lynne Lawrence https://www.amazon.com/Montessori-Read-Write-Literacy-Children/dp/0091863511 . Any local effort could form around the above expertise and off the shelf first things first continuous improvement principles given rainmaker money to solve constraints to create the extra good, better or best outcomes. We make the claim that extra best outcomes would be worth at least an extra present value of $500,000 in GDP over the future life of the child at age 6. Present value lost per year (not achieving best outcomes possible) on 4,000,000 children is staggering. Our nation’s public sector staggers year after year without defining best end in mind outcomes for the child starting kindergarten. You will find this discussion ( http://education.state.mn.us/MDE/fam/vpk/ ; http://education.state.mn.us/MDE/fam/elsprog/; http://education.state.mn.us/MDE/fam/elsprog/elschol/index.htm ; http://helpmegrowmn.org/HMG/index.htm; http://education.state.mn.us/MDE/fam/elsprog/start/; http://education.state.mn.us/MDE/fam/wbwf/ ) to be complicated (need to find space for all in the bureaucracy) and beyond what urban mom can understand as to what will make her influence her child and the school system.. Deep within this discussion you will find the 96 Early Childhood Indicators of Progress. Every State has them and Parent Aware is Minnesota’s Quality Rating and Improvement System, designed to support and improve the quality in early childhood programs and inform parents about that quality. In order for a district to access ELC Title I Incentives, the district program must commit to becoming rated through Parent Aware. School district programs applying for a rating will need to satisfy requirements for curriculum, assessment and teacher training. You can look to the reading and math indicators and note they do not include really-ready to read. Very deep within the public sectors standard all the programs come up short against what is best practice and setting the higher levels of achievement before kindergarten. You know where the gap is coming from, the private sector has rejected with its feet the definition of what a child should know going into kindergarten. It is fair to say the risk factor in the USA is huge and growing if a person does not have competitive language skills. Risk is reduced with language skills in the land of opportunity, generosity and second chances. This assignment of risk factor is conceptual and requires work to be exacting; but, that is not needed to make the point and set the goal to reduce the risk factors. Demonstrated earnings based on education attainment data leads the way to act with no choice, just following what is common sense. It is now possible that we the people so wish it and make it happen as a matter of attitude and course of activity like the process of inoculation to keep the child and society safe. This needs to be paid for with NewOldMoney already on hand at the FED. The FED would need to accept its role as the private sector proxy stuck into the Federal Government between the Treasury and the people. It is not that complicated – In order to do this, in reality – on the street – for every child – we describe this effort as ERSD-RA and the FED pays for it as if it is micro monetary policy. We the people would be demonstrating the true lack of status quo bias, racism and white privilege. This action would exclude the creation of disparities based on birth by definition for at least the ages of 0-6. Again – being real about it, the adult population has to see this as Socratic first things first. There is universal agreement that lost time cannot be recovered and that sensitive periods to learning language cannot be recovered. Private sector can make money systems out of defined outcomes over a defined period of time. Older adults already see their children handling equality better than themselves. Please read Chapter 1 and chapter 16 of the 4% Growth Solution published by the George W. Bush Institute. If we were growing GDP at 4-5% there would be no deficit projected. The issue is there is no recent support for projecting a 4% growth factor and this issue of equal readiness for extra GDP expected from the new citizen base is the fastest route to supporting a 4-5% factor. In fact the nation could decide to do this tomorrow and get to work. Insert into chapter 16 100% ready to read children verses a purge and bettering of teacher quality that is very subjective to measure and achieve. Could 100% really ready to read before kindergarten be educations sure bet way to contribute to 4-5% growth. Think locally and nationally about the $500,000 minimum present value arc of GDP value increase (over 45 years) for being ready to read starting kindergarten. ERSD-RA correlates to a lower risk path to graduation. It sets up the very early basics to more significant graduations and even higher present values of efforts completed. DO YOU UNDERSTAND THE POWER THIS GIVES YOU AND PUBLIC EDUCATION? Mine the Gold! !